Purpose: Nonsteroidal anti-inflammatory drugs lower the incidence of and mortality from colon cancer. In this paper, we present the effect of indomethacin on growth inhibition and alterations in the expression of several genes involved in cell cycle and apoptosis in CaCo-2 colon adenocarcinoma cells. Methods: We used the MTT test to evaluate the effect of indomethacin on the proliferation rate of colon cancer and normal fibroblast cells in vitro. The expression of c-myc oncoprotein and p53 and p27 suppressor proteins was examined using the immunocytochemical method. Results: We have shown that indomethacin reduces the proliferation rate of CaCo-2 colon cancer cells (up to 60% at the concentration of 4 × 10−4 M), alters their morphology, and induces cell death by apoptosis. The most pronounced inhibitory effect was observed at the concentration of 6 × 10−4 M where the growth was completely suppressed. However, the growth of normal fibroblasts (Hef 522) was much less inhibited (about 30% of inhibition at the concentration of 6 × 10−4 M). 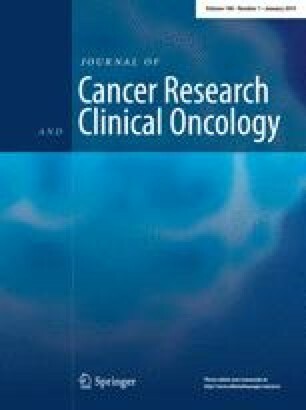 Indomethacin reduces the proliferation rate and induces apoptosis in CaCo-2 colon cancer cells through enhanced expression of c-myc, p53, and p27 proteins. Conclusions: This is the first report about p27-increased expression in colon carcinoma cells induced by indomethacin treatment. Increased expression of p27 represents a new mechanism of apoptosis in cells treated with NSAIDs (indomethacin). This effect probably contributes to the anti-proliferative effect on colon cancer cells in vitro.